Click on title to view photo in large format. Oppede-le-Vieux is one the lesser known but very beautiful hilltop towns scattered across Provence, France. These towns emerged during medieval times, when it was common for bands of raiders to sweep through the plains, pillaging and killing everything in their wake. The locals fled to high ground, building encircling walls that provided protection against the hordes. Many of these villages suffered severe damage during World War II and were subsequently abandoned. Some, including Oppede-le-Vieux, were rediscovered by artists, who moved back in during the 1950’s and began restoration efforts. In Oppede-le-Vieux, the medieval church atop the hill at left has been completely renovated. The castle on the right side of the hilltop still lies in ruins, however efforts are underway to restore it as well. Eventually, these “perched villages” were discovered by tourists. Restaurants and hotels were quick to follow. Today these hilltop towns are some of the most popular tourist destinations in Provence. Wherever I travel, I always look for those narrow alleys to photograph, or scenery through open windows and doorways. Your photography is superb, and how interesting are your description and notes. Thank you so much, Walter. I am thrilled that you enjoy my work. 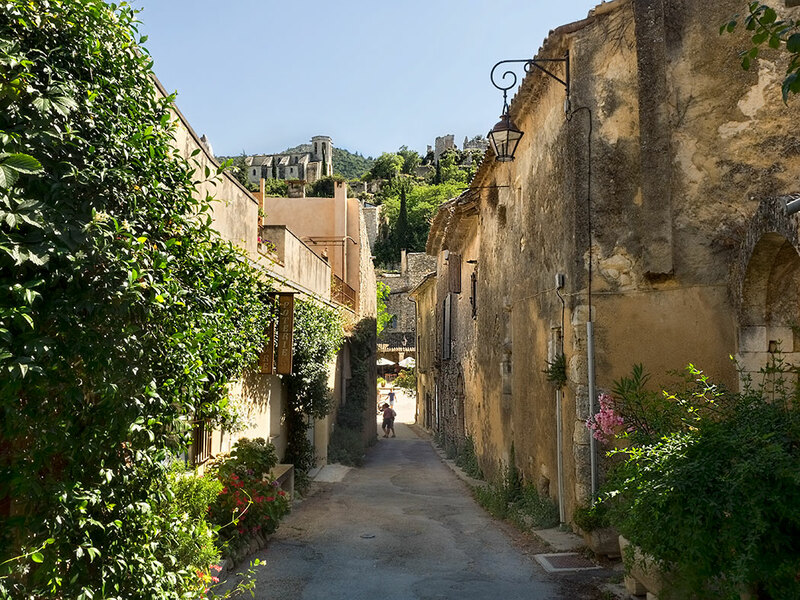 Excellent photo, Barbara, and thanks for the history of these hilltop villages in Provence. I enjoy the memories that your photos and stories bring back 0 thank you for that, as well! Thank you so much Irene. You continue to be one of my most loyal readers and for that I am so grateful. I’m traveling to Provence next month. I can not wait! This photo is so inspiring! Oh, you’ll love it Penny. I fell in love with Provence and want to go back again and again. Thanks so much for your comment.